Entries added into Client Payments affect client balances, unpaid client invoices, and the general ledger at the same time. Client Payments is where youll account for most of the shops incoming cash. Client payments are typically entered each day as you receive checks from clients. Payments are added using the open-item method, which means youll apply each payment to specific unpaid invoices. Heres how it works: The clients check is added, then saved. The clients unpaid invoices are listed by date, oldest first. The checks amount is applied to invoices automatically, until the payment is fully applied. For flexibility, you can adjust how a payment is applied to invoices. Client payments must be balanced, which means the payments to invoices must equal the checks amount. If not, the check cant be saved. Early-payment discounts can be applied to unpaid invoices, which post to a special discount account in the general ledger. Client payments arent posted automatically. A new client payment can be saved, then edited or deleted, anytime before it is posted. Posting makes the client payment permanent. Reports can be printed from Client Payments showing payments made by clients for any range of dates and an accounting period. These reports can be compared to audit trails and journals from the G/L for easy auditing. 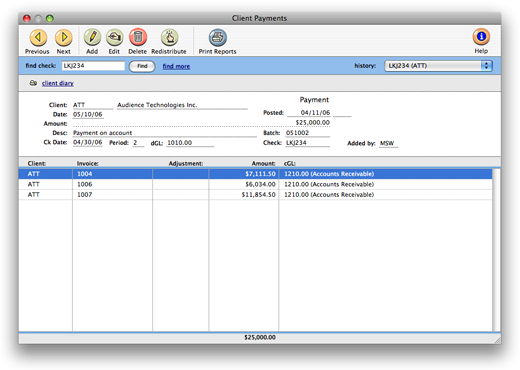 The Client Payments window opens, displaying the last added client payment. In the find check field, enter a client payment number to find a payment. Or use the find more link to find one or more payments by check number, date, client, check date, deposit batch, amount, or sequence. Client Payments should be added when you receive the client's check. You'll track your cash better, since deposits will be accounted for faster. Client payments are applied to unpaid invoices. When the payment is posted, the invoices will appear as paid. Click here for step-by-step instructions. Client Payments can be edited, redistributed, or deleted entirely anytime before posting. You can change the payment's check number, date, check date, accounting period, dGL, and description. Because a payment amount must balance to its distribution (i.e., line items), you can't easily change a payment's amount. You also can't change the client number, since the payment is linked to one client's unpaid invoices. Click here for step-by-step instructions. Redistributing a payment erases its existing line items, which means you'll be applying the total payment amount over again to the client's unpaid invoices. Don't redistribute if you don't want to lose the payment's line items. Click here for step-by-step instructions. The Client Diary/Call Log window lists all of the entries users have made about interacting with the client, whether it is a phone call or just a note (a diary entry) about something that is going on. Click here for step-by-step instructions. Learn more about Client Payments in this Clients & Profits classroom video training session.